Props to @majorcbs for mentioning that as a senator, Obama voted against an increase in the debt ceiling. What everyone who makes this point knows, or at least should know, is that Obama’s 2006 vote has absolutely nothing to do with what’s going on with the debt ceiling right now. Because, Major Garret’s kudos-garnering observation notwithstanding, finding votes for the debt ceiling was never complicated until Obama became president and the GOP decided, for the first time ever, to make it complicated. Previously, the debt ceiling was raised on a regular basis without much trouble. The party in the majority of each chamber of Congress unenthusiastically but faithfully supplied the votes necessary to raise the ceiling, and the party in the minority cast symbolic “no” votes that they knew would have no effect on the outcome. When Obama, along with every other Senate Democrat, voted against raising the debt ceiling in 2006, they did so for the sake of self-serving political posturing, yes, but they also did so knowing that their GOP colleagues could and would dutifully raise it on their own. If political posturing was all the GOP was doing now, then Obama would hardly mind. In fact, Obama backs a proposal that would put the entire onus of raising the debt ceiling on himself while giving congressional Republicans the power to cast symbolic votes in opposition of their own spending. But, as we saw in the summer of 2011, and again presently, a large chunk of the House GOP is willing to vote against raising the debt ceiling even though their votes are vital. 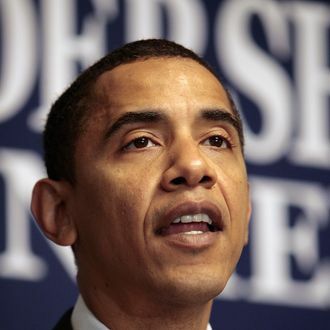 To put everything in basketball terms, for no particular reason: In 2006, playing for Team Congress in a game against Team Economic Calamity, Obama turned the ball over on an ill-advised, no-look, behind-the-back pass, but he attempted the pass knowing that Team Congress was up by twenty points with two minutes left in the game. In the 2012 rematch, Republicans on Team Congress want to play just as irresponsibly, but this time the score is tied. It’s hardly hypocritical for Obama, now head coach, to tell his players, “Hey, don’t be stupid. You’re going to hand the game to Economic Calamity.” Unfortunately — to continue this overly elaborate analogy — the GOP and Coach Obama have something of a Sprewell-Carlesimo relationship. Obama Voted Against Raising Debt Ceiling — So?